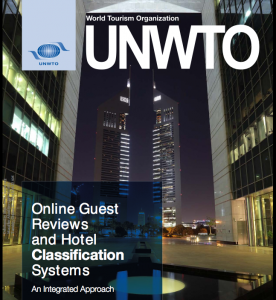 The UN World Tourism Organization and Norwegian Accreditation’s latest report presents an in-depth review of the impact and benefits of integrating online reviews into traditional hotel classification systems. The emergence of user generated reviews has “completely revolutionized the travel decision-making process” as more and more people rely on these reviews to make purchasing decisions. Both reviews and hotel classification systems serve important and complementary purposes, and a combination of the two is needed to meet the needs of today’s travelers. For this report, surveys were created to assess the opportunity of integration for all stakeholders: the consumer, the hotel industry, star ratings and classification organizations, and intermediaries. The authors of the report propose a granular inclusion of guest review data into the classification process that recognizes the different uses of review and classification information. On the one hand, reviews reflect post purchase satisfaction and the degree to which expectations have been met, hence the reason why a 2 star hotel may get great reviews compared to, say, a 4 star. On the other hand, classification systems have historically been about an amenity checklist. In this proposed framework, reviews do not replace star ratings, but rather improve the classification process. While traditionally, classification systems have been based on amenities, and guest reviews have been about meeting expectations, combining these rating systems can create an environment where everyone wins: hotels are incentivized to provide the best possible experience for their customers, which in turn increases the likelihood these travelers will return to the destination. Finally, creating an integrated model where online reviews are factored into hotel star-rating programs is likely to generate positive financial returns for its participants. Multiple research studies have confirmed that demand and pricing power are a function of online reputation, so it follows that aligning hotel classification systems with online review scores creates an environment where every hotel business is incentivized to deliver great travel experiences for their guests in order to accelerate their own hotels’ revenue growth.